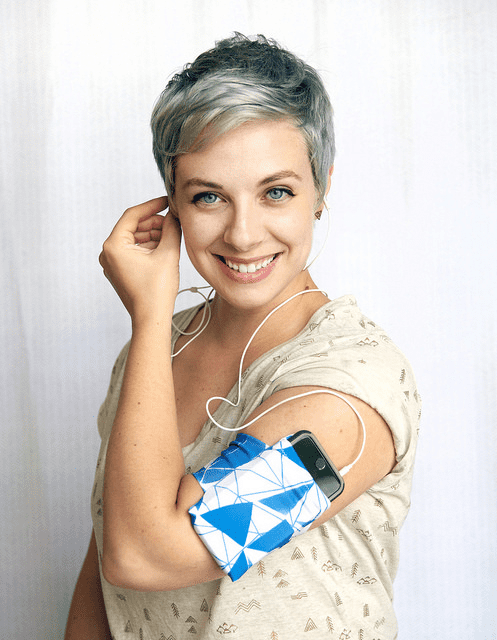 Step 1: Download and print your pattern. To get started, you need to download or purchase your leggings pattern. 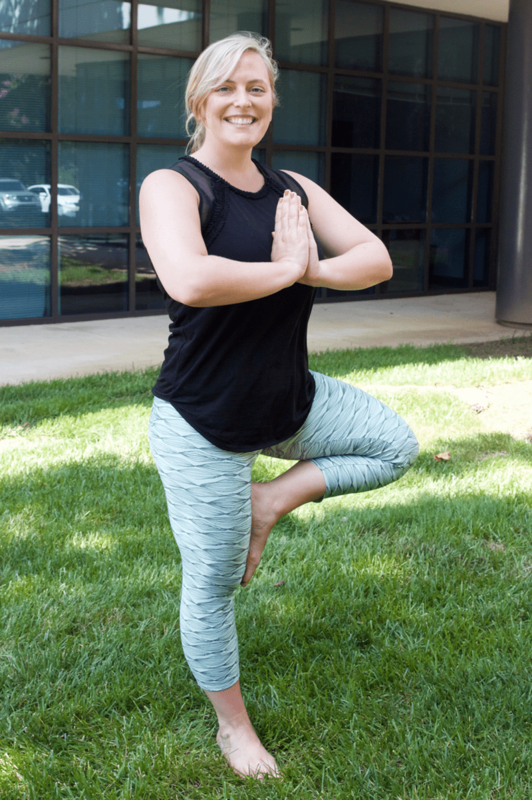 We recommend the Sloan leggings by Hey June Handmade, just $10.00 to download and also available on Sprout. Once you’ve opened the pattern and printed a copy, you’ll need to lay out the pieces, tape together and cut out your size. We found that the pattern fit a little snug so going up one size may be best depending on your fit preference. Step 2: Choose your orientation and pattern layout. 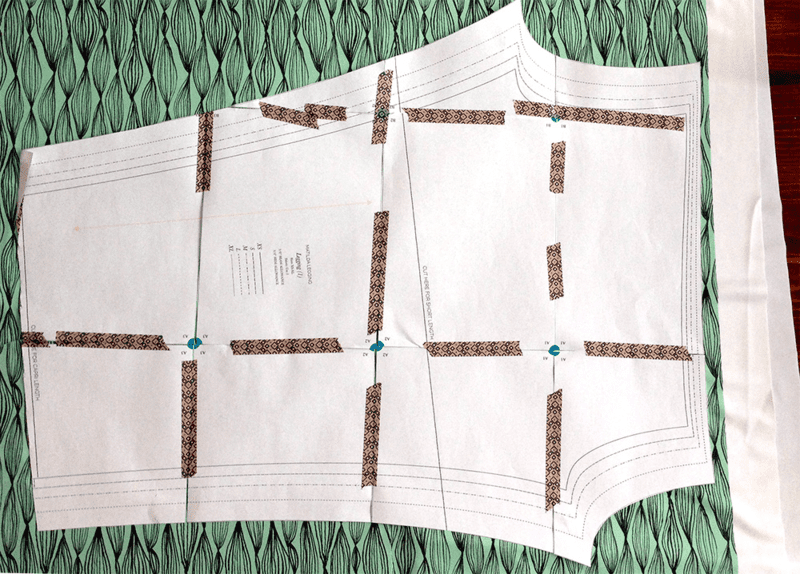 Once your pattern is assembled and cut out, it’s time to cut out your fabric pieces. 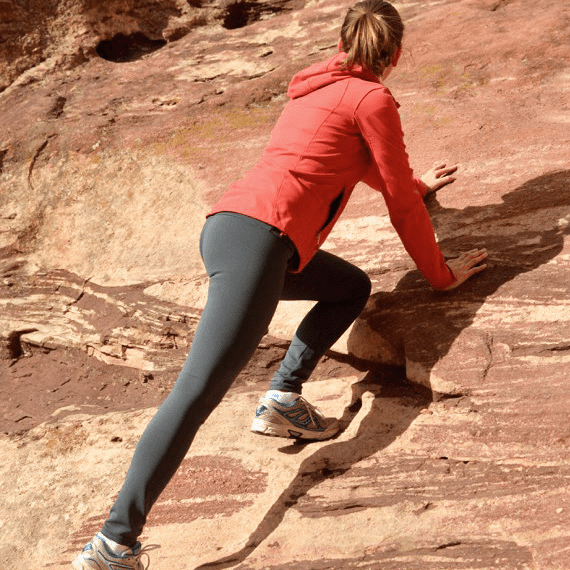 Sport Lycra has a four-way stretch making it possible to cut with the grain or cross grain, but the fabric stretches much more across the grain than along the grain line. If you want the greatest amount of stretch to go around your body, cut your pattern with the side seams running along the selvedge. If you want to get one pair of leggings out of a yard of fabric and cut down on grin, cut your pattern on the crossgrain. If you plan to cut your leggings on the crossgrain, you’ll want to choose a non-directional pattern. 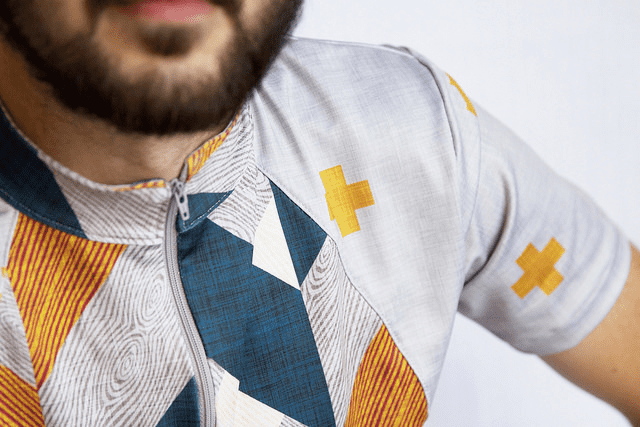 If the design you plan to use is directional and runs the length of the fabric, you’ll end up cutting your pattern pieces with your design sideways. Also, keep in mind that if you cut a knit garment on the crossgrain (with the greatest stretch running up & down the body), the garment could end up too tight and will stretch in length as it is worn. Cutting on the crossgrain will also place more stress on the seams and could cause them to pop. That could be a serious UH-OH! with leggings. 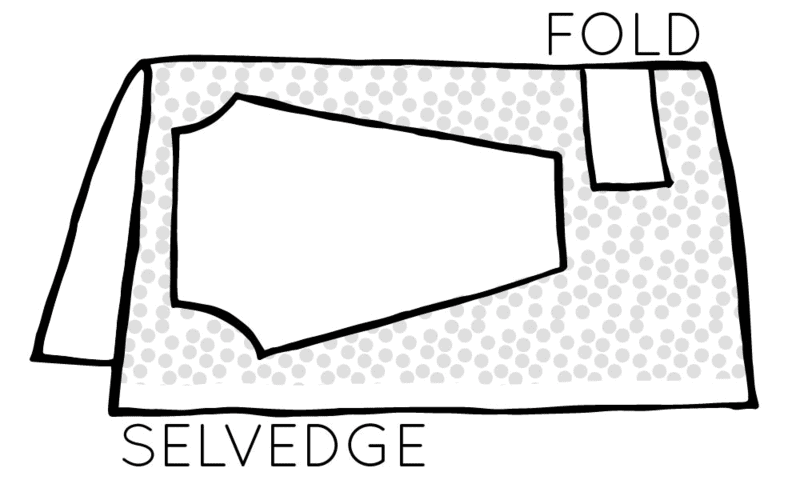 **If you need help understanding the anatomy of a yard of Spoonflower fabric, check out this helpful article! 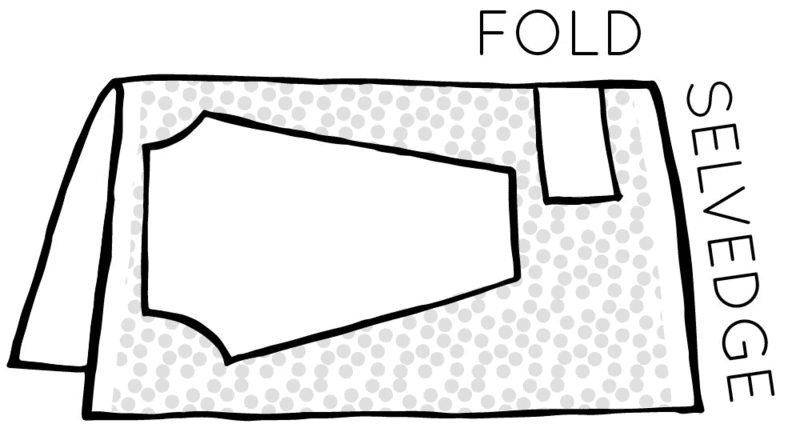 Once you’ve decided which way you’d like to lay your fabric, fold the fabric in half, lay out your pattern pieces, and cut your fabric pieces. Step 3: Sew up your leggings! First, you’ll stitch up the inseam of your pants. 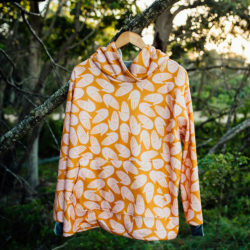 So that the fabric will stretch and give, either use a serger or a zig-zag stitch on your standard sewing machine. 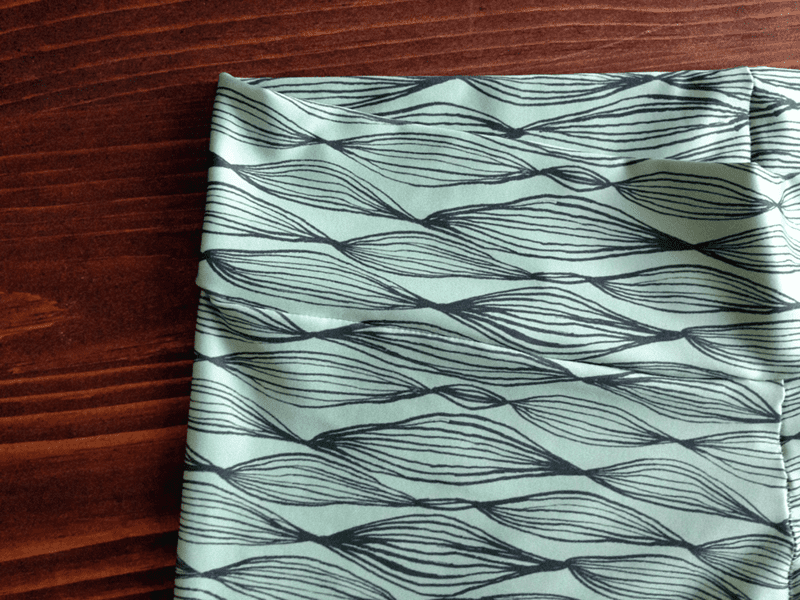 A universal or ballpoint needle works best with this fabric. If you’re using a serger, the serger blade does need to be sharp. The differential feed on the serger might need to be lowered slightly and make sure the stitch length isn’t too long. Test samples are helpful. 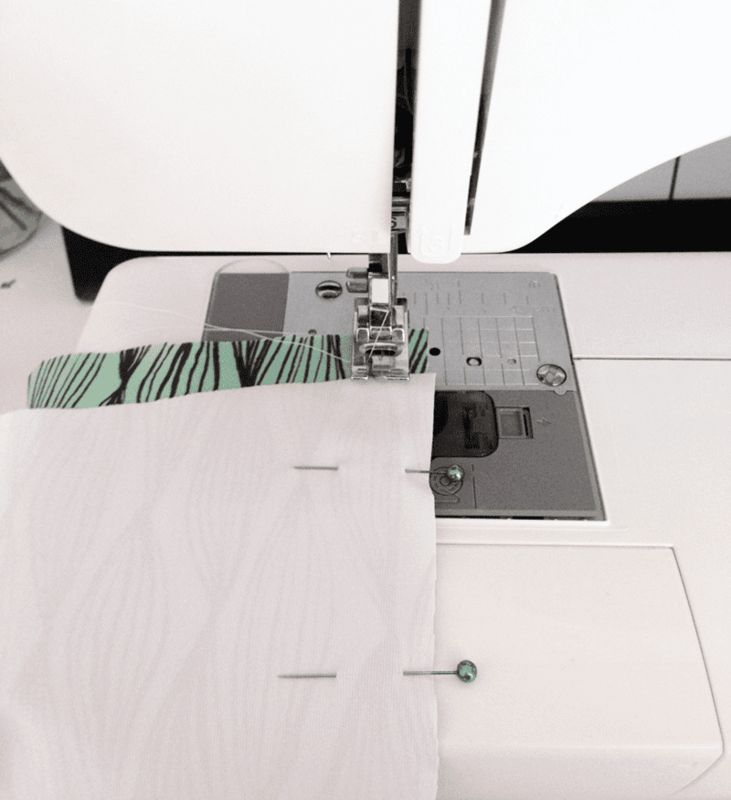 For a standard sewing machine, a 3 step zig zag will be more secure than a standard zig zag. Increase the stitch length to 3.5 – 4. For smooth topstitching, increase the stitch length to 4 – 4.5 and decrease the pressure foot pressure to allow the fabric to move more smoothly over the feed dogs––a walking foot is quite helpful. Once your machine is all set up, place right sides together, then line up and pin your inseams for both legs of your leggings. Once pinned, sew your seam. Once you have sewn both inseams and have two pant legs, you’ll then sew those together. Turn your pant legs right side out and with right sides together, line up the inseam first and pin the rest of your crotch seam. Once pinned, sew the crotch seam. Now you have pants! They just need a waistband. 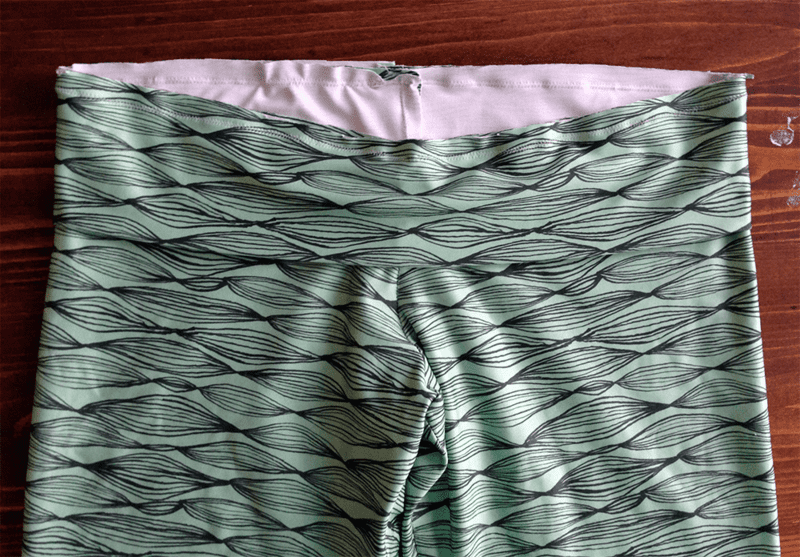 Take the large rectangle waistband pattern piece and fold it in half and sew the two shorter sides together. Turn the sewn circle right side out and fold in half with raw edges aligned so you have a more narrow circle. Slip the waistband over your leggings (all raw edges should again be aligned) and pin the two unfinished sides to the top of your pants with right sides together. 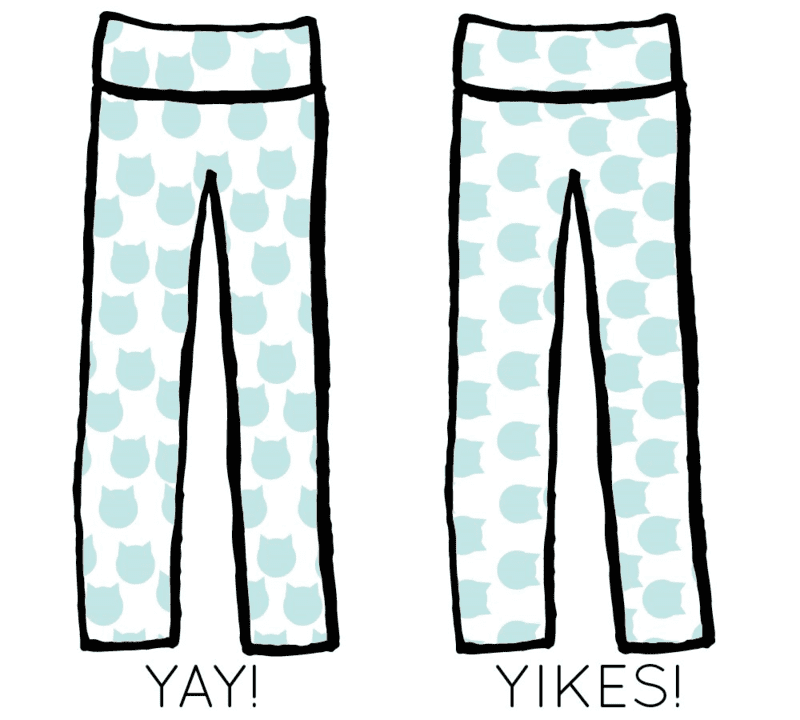 Sew together, flip the waistband up and you’re ready to slip on your sweet new leggings! We hope you’re as excited as we are to sew with Sport Lycra! Please tell us what you plan to make in the comments below or share with us using #Spoonflower on your favorite social media platform! Fantastic new product! As a seasoned sewist, I would recommend tracing the pattern in the correct size out of tissue before cutting out the fabric. This way, it’s less cumbersome especially with knits and the cutting is way more accurate, especially if you choose not to hem. Just a question: what pattern did you use for the bike jersey shown above? I would LOVE to make on with the new sports Lycra! Thanks, Kelly!! And thanks for sharing a bit more insight with the community! Thanks, Andrea!! We're so excited too!! Thanks Allie! That is awesome!! I wonder if we can use this fabric to make custom swimsuits? yes, Sport Lycra is swim-approved and perfect for handmade suits! Hmm, that’s something to keep in mind. Thank you! We didn’t use a specific pattern for the cell phone arm holder, but our crew member who stitched that up is going to write up a tutorial! Stay tuned–it should be live in the next few weeks! What kind of thread is the best to use with this fabric? I would also like a reply top this question. Hi Barb, a regular old polyester thread will work just fine! Got my sample the other day and brought it to work….I am a gymnastics coach. The entire team went wild over it and all are requesting custom leotards for the up-coming season. What wonderful fabric. 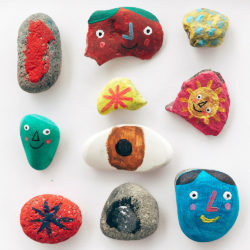 Look forward to buying LOTS OF IT!!! Jennifer! That's fantastic–thanks for sharing! How does this fabric compare to Neoprene? I just received my sample and it feels fabulous! Got my swatch and it’s totally awesome. The colors are so vibrant, and the quality is amazing. 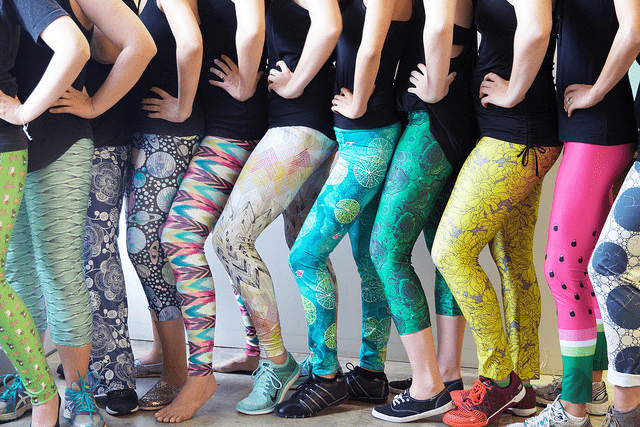 Cannot wait to make leggings for my Zumba class, everybody is going to want some! Thanks for sharing, Lucie! We're thrilled to hear you love Sport Lycra as much as we do! Neoprene is more of a "foam" type structure. I also think of neoprene as more of an insulating/barrier type material. Sport Lycra is definitely a knit with performance properties (e.g. stretch and wicking), but I would not describe it as thick or insulating like neoprene. I hope this helps provide some clarity. Please let me know if you need further help! Do you think the above leggings pattern would also work with modern jersey? If I was looking for something a bit thicker and with a more matte look? thanks! While Modern Jersey can be used to make leggings, it is actually a bit more sheer than Sport Lycra. If printing with a light design, Modern Jersey is not ideal for leggings. Sport Lycra is going to be our best fabric for leggings, but does have a bit of a sheen to it. Love this! But the pattern isnt availeble for downloading. Is there anyway i can get this pattnern? Thinking of using the sport lycra for capris for stand up paddling/surfing. 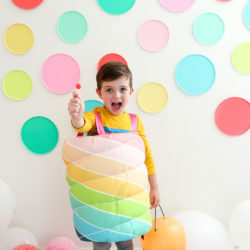 Has anyone used this fabric in the ocean? How durable is it? Thanks – very excited to see your products! Hi. Can i make the leggins using an overlocker rather than a regular sewing machine? If we can’t do this ourselves but have printed fabric we want to turn into pants who do you recommend that can make them for us?! Tia!